© 2005 Diana Coate Wolverton. All rights reserved. Perhaps no other single verse in my life’s hymnal affects me as profoundly as this one. Its words overwhelm me with an enormous sense of humility because I cannot fully fathom the depth and width and breadth of Christ's love for me: Love so amazing, so divine. 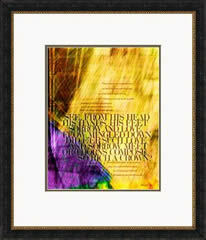 This limited edition fine art print is produced and sold by Diana Wolverton Studio. To order with your personal check or money order, download our mail order form. Please read about our shipments to international addresses and then about ordering by PayPal. Limited editions are printed in the artist’s studio using museum-quality archival paper and inks. With proper care, your art work will delight you and future generations with its timeless message. This unframed 16"×20" print is designed to fit in a standard 20"×24" mat with a 15½"×19½" window. Using a standard-size will overlap the image by about ¼" all around and will cover the artist’s signature, work title, edition number, and embossed studio hallmark. We want your Hymnscript print to be a blessing to you and others, so if you're not satisfied with it for any reason, simply return the print to the studio in salable condition within five days of receipt. We'd be happy to answer any questions you may have about this limited edition print. Please contact the studio.